If you’ve ever accidentally purchased the wrong size bedding, you already know why it’s important to understand mattress sizes to a T.
Investing in the right mattress size will give you all the stretching and sprawling room that you need for a comfortable night’s sleep. But finding accurate sizing standards can sometimes be difficult. Mattress sizes vary widely from country to country – and there are some specialized mattress sizes that many don’t know about at all. 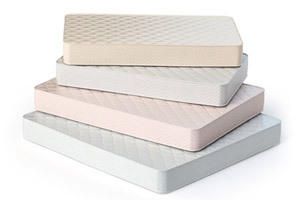 To help you understand which mattress size will best fit your needs, we have compiled a chart and other information on the standard US mattress sizes. Choosing the right mattress can make a big difference to your quality of sleep as well as the functionality of your room. Below we have listed some recommendations on why you might want to consider various mattress sizes. Twin beds are also sometimes referred to as “single” beds and are often chosen for children’s bedrooms, offering the perfect amount of space for little ones. For adults and teenagers, choosing Twin XL may be a better option because it still offers great functionality if you are dealing with limited space (for example in a dorm room) but the added length ensure that your feet are not dangling off the edge of the bed. A full bed is a step up from a twin bed, which is why it is sometimes referred to as a “double” bed. This option is great for teenagers and single sleeper adults because it provides the perfect amount of room for stretching, without taking up too much space. For those who may be a little bit taller, choosing a Full XL will provide you with the same length as a queen or king for extra wiggle room. Queen beds are the most popular bed size for double sleepers, like married adults. This is because it offers plenty of room for each person to either spread out or cuddle together. One of the biggest misconceptions when it comes to mattress sizes is that the California king bed is the largest mattress size available, when it is actually smaller than the standard king bed. This is because the California king bed is 4 inches longer than a standard king (84″ vs 80″), but it is also 4 inches narrower (72″ vs 76″). Because of the smaller surface area of the California king bed, it means that sleeping partners will have slightly less room between them than if they were sleeping in a regular king. Nevertheless, a California king bed is certainly an upgrade from a standard queen, giving the sleeper much more room, both width and length-wise, while carrying with it the exotic reputation of its rarer size. King beds are perfect for those who want to sleep in spacious luxury while making a bold statement in their master suite. Whether you are looking for an elite mattress for your bachelor pad or a mattress that can accommodate the whole family during movie night, a king offers optimal comfort and space. The king is the largest of the standard mattress sizes, but for those who want to go extra-large, there are some other semi-common sizes that even beat the standard king. The “grand king” or “superior king” often come in a whopping 80″ x 98″, but this bed size is hard to come by and often needs to be special ordered. Choosing the right mattress size can ensure years of comfortable sleep ahead as you grow and your mattress needs evolve. Mattresses can last up to 10-15 years, so choosing one that will be able to accommodate different homes (and possibly varying sleeping tenants as your family grows), can provide years of dreamy sleep and utility – so choose wisely!